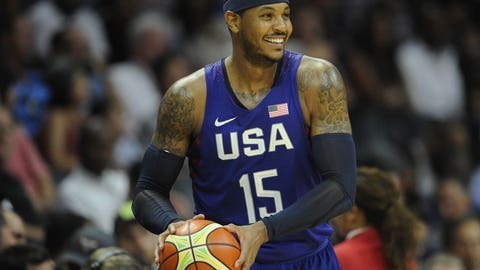 Clippers rumors: Could they beat the Warriors with Carmelo Anthony? The latest Clippers rumors look at the chances of Carmelo Anthony giving Los Angeles enough to top the Warriors. Given the explicit interest in where Carmelo Anthony could go outside of New York, Clippers rumors still have him in the picture. If a deal is reached before the trade deadline, it would change the league dramatically. During the transition of previous superstars to new teams, the focus has been more on excitement. This time, though, it’d be filled with more questions than answers. With regard to the team’s expectations, it’s safe to say that their championship window would stay open just a short time longer. To get to that point, they’ll have to at least get through Golden State. Barring some sort of historic first round collapse, of course. Keeping their key players healthy has proven to be a problem as of late. Last year, it escalated to both Blake Griffin and Chris Paul being ruled out. They can’t afford that misfortune anymore. Taking Carmelo Anthony under their wing doesn’t come without precautions. Chemistry issues are one of the core dilemmas he still continues to face with the Knicks. It’s the last the Clippers want, and the only thing they can’t afford. Looking at the big picture, what they end up giving to New York for Anthony matters, too. Jamal Crawford and JJ Redick have been names in the trade mix, but nothing has been established yet. Should a deal involving those players go through, Los Angeles would risk losing key pieces of their offense. Areas such as three-point proficiency and long range shots would be traded away for star status that has the chance to backfire. If Anthony ends up in Los Angeles, that’s great and all. But beating the Warriors won’t be solved overnight.